From stories about Roger Ebert, Aaron Swartz and Sebastião Salgado, to an inside look at Studio Ghibli and Edward Snowden's whistle-blowing, 2014 documentaries have been nothing short of extraordinary. I'm honestly still a bit new to documentaries, it took my years to get into them in a way where I could actually feel comfortable about delivering a Top 10 list. But in 2013 I fell in love with docs, there were so many I saw that blew me away, that showed me the power of documentary filmmaking and the potential it has to be as exhilarating and enlightening as any narrative feature. After catching many excellent docs at film festivals this year, I submitted my Top 10 picks to the outstanding doc site Nonfics, and I'm sharing them below. The first note is that I choose films from this year based on when I saw them, including at film festivals. So, for example, Joshua Oppenheimer's The Look of Silence has earned a spot on my Top 10 this year because I saw it at the 2014 Telluride Film Festival even though it doesn't hit theaters until 2015 from Drafthouse Films. Additionally, this means that Jodorowsky's Dune was actually one of my Top 10 films of 2013, and doesn't make the cut on this list (even though I saw it multiple times in 2013 and totally loved it, it's not a 2014 film in my book). That said, many of these documentaries have already been released this year. They're all worth seeing whenever/however you can catch them, whether in theaters or at home. Just watch them. 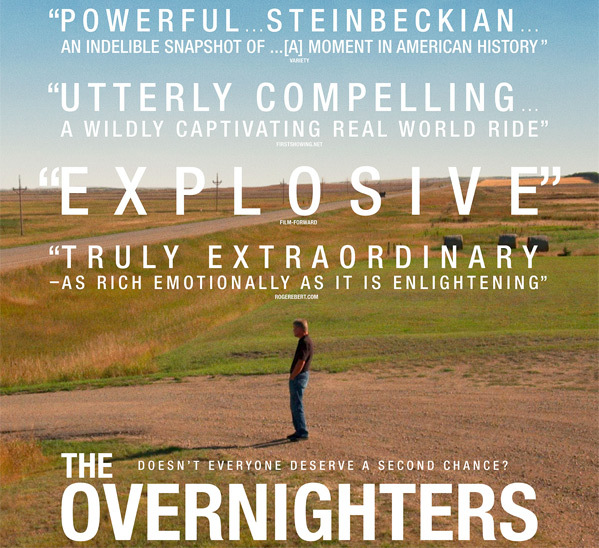 My #1 film is The Overnighters directed by Jesse Moss (interviewed here), a documentary that premiered at Sundance 2014 and floored me. This is modern documentary filmmaking at its finest, showing not only what is capable with modern technology (he uses footage from cell phones, Skype, and his own vérité work on location) but also how much can be discovered through the actual act of filmmaking. It's just incredible. I followed the film throughout the year, it was acquired by the intrepid Drafthouse Films for theatrical release in the fall fall, and was given a strong push by the studio for awards acclaim. It made the Oscar shortlist, but awards don't matter. I really love this film and want as many people as possible to see it; it's a revelation. I really connected with a number of these docs this year, with the subject matter speaking directly to me and my sensibilities. From The Internet's Own Boy about activist hacker Aaron Swartz, to Citizenfour about NSA whistleblower Edward Snowden, to The Salt of the Earth about renowned photographer Sebastião Salgado, to Life Itself about film critic Roger Ebert. The one that made me cry the most, dare I admit, was The Kingdom of Dreams & Madness, an inside look at Studio Ghibli. It's as inspiring as what Leslie Iwerks did for Pixar in the doc The Pixar Story, but for Miyazaki and Studio Ghibli. Another must see. All of these films inspire action, but The Salt of the Earth was so powerful it made me want to go plant a tree at the end. Over on Nonfics, they put together a Best of the Year ranking through submissions from critics, journalists, festival programmers and filmmakers. What was #1? The Overnighters of course, followed by Citizenfour and Life Itself. As much as I flipped for Citizenfour at first, additional discussion with friends and further contemplation made me shift the film a bit lower in the list. I also had to move up The Internet's Own Boy, because that doc has stuck with me throughout the entire year after seeing it at Sundance. Aaron Swartz and I are very alike. To me, those are the best films - that ones that get into your head, and stick with you, always coming to mind when thinking about the world and the people on it. Those are the ones that leave a mark. Other great 2014 documentary recommendations to watch (even more here): Particle Fever, Nick Cave's 20,000 Days on Earth, National Gallery, Finding Vivian Maier, The Unknown Known, Fed Up, Merchants of Doubt, Last Days in Vietnam, 12 O'Clock Boys, The Dog, Actress, Keep On Keepin' On, Tim's Vermeer, The Battered Bastards of Baseball and there's also Manakamana. So there you go. Thanks to the filmmakers that made these documentaries my love for the genre continues to grow, and I'm excited to see more and more each and every year. I always suggest taking a break from narratives to watch a documentary every once in a while, especially some of these, they're refreshing. Enjoy. I am really looking forward to being able to see many of these documentaries. By chance I found an independent cinema here in South Korea! It plays films like 3-4 months from the Stateside release, but at least I can check them out in a theater! I wish docs were more readily available on streaming services like Netflix etc. I really want to see these! I saw Dinosaur 13 at Sundance, wasn't the biggest fan. Definitely not what I was expecting either, and it was effective at making me feel outrage towards the government, but by the end of the fest I was in love with so many other films (including the Aaron Swartz doc, Life Itself and The Overnighters). But yes, it is another good recommendation.